Technique | Seki Kanetsugu Cutlery Co. Since its founding, Seki Kanetsugu has incorporated the techniques first developed by sword smith Kanetsugu, who first started making swords in Mino around Jowa Years (1345-1349), continuing through the hard times of the Nanboku-cho, Sengoku, and Edo eras. Employing such techniques ensures secure durability, sharpness, and longevity. 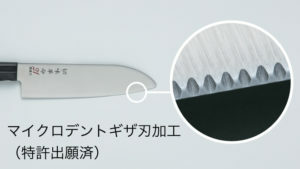 We use such classic blade techniques in tandem with several modern methods such as the sub-zero process and varying welding styles to produce household knives that we hope will come to be loved not only in Japan but soon all over the world. 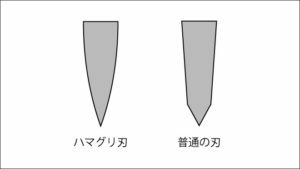 The knife was created have be clam-edged like a Japanese katana. This not only gives it samurai sword like sharpness and durability, but the style is also easy to re-sharpen when it dulls. Sub-zero process is a special treatment to increase the knife’s durability to be unbending and sharp by cooling it to negative seventy degrees Celsius or negative ninety-four degrees Fahrenheit. Our micro-dent carving process can make the blade’s sharpness last five times longer than that of the average kitchen knife. This edge itself is no different, but the way in which you sharpen it sets it aside from its competitors—all you have to do is sharpen its backside edge. We use this machine to reduce the thickness of the edge. Using machines with up to 6 axels, we grind the edge precisely in increments of one-hundredth mm while controlling numeric data on computer. This is to polish the blade/edge. It is done as the final step in the process and it is performed while controlling numeric data on the computer. We polish up knife at the final step while controlling numeric data on computer.. There are welding machines that use lasers, TIG, and robots. We use them properly according to the knife type or welding part and weld the handle part with a blade or metal cap to ensure it has enough strength. This machine polishes the welded part between the handle and the blade. After doing this, you can see an evenly beautiful surface. We use this to print something on the blade or the handle part. There are two different types that we use, the CO2- laser marker and the hybrid-laser marker. The CO2-laser is for the wooden handle part, while the hybrid-laser can be used for the blade as well as the handle. This machine can polish all parts of the knife, such as the back side, blade, or metal cap. We control numeric data on computer to get an evenly beautiful surface. Skilled craftsmen use this machine when attaching the blade while water flows over it. Water ensures good sharpness while keeping away heat which can decrease the knife’s strength. We change the attachment to grindstone, paper, puff or satin according to the work needed. We work together this machine when the work is too detailed to be done with a machine alone.